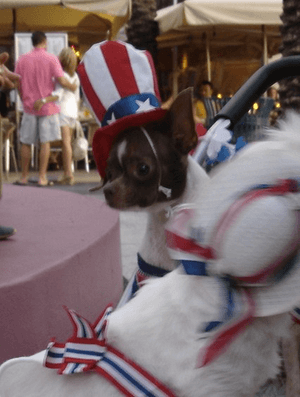 This patriotic canine and his three dog buddies were being pushed in a baby stroller in Miami Beach this past July. I love dogs and I live in one of the United States’ friendliest dog towns (Alexandria, VA). There are lots of dog lovers in this part of the world, and I usually sell one or two donated puppies each year as part of a live auction fundraiser. Selling a puppy in a live auction is certainly memorable and profitable. Here in Washington, D.C., the puppy can bring $2000 to $5000 per sale. Most bidders respond to the animal positively and are eager to pet the little guy while inquiring about its age, vaccinations, breed, etc. To make the sale a positive experience for human and creature, here are some tips. Choose a popular breed; avoid exotics or any breed with negative press. I adore pit bulls, but I don’t suggest selling one in your auction fundraiser because of the negative press they’ve received. Similarly, the odds of selling an “extra-large” dog (e.g. Great Dane or Mastiff) will appeal to fewer guests. Mixed breeds can be successfully sold, especially if it combines two popular breeds (i.e. cockapoo or labradoodle). 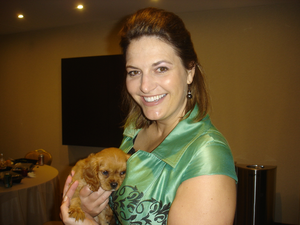 Here I am, holding a King Charles cavalier spaniel puppy before the live auction. He “fetched” almost $4000. 2. The puppy’s temperament should be calm. If you have an option, select one of the least high-strung puppies of the litter. As adorable as that puppy is when its squirming in its pen, we don’t want a puppy squirming in a volunteer’s arms during the auction. Calm, quiet dogs show best and will sell better. 3. Sell the animal early in the live auction. For the puppy’s sake, have the animal inside the live auction room for a minimum length of time. Noise can be hard on those little ears! 4. Sell one animal per gala. Keep it unique by only selling one puppy, unless you possibly can sell one “brother” or “sister” in the litter, too. 5. Know that some national groups don’t agree with the sale of live animals at a gala. The official position of the Humane Society is that animals should be prohibited from being sold during an auction. Animal rights groups have a fear (perhaps valid) that the dog will go into a home where it won’t get good care. Consider ways you can protect the animal to ensure it goes into a great home. Every creature deserves TLC. I support the Humane Society’s position and think it is wrong and in bad taste to sell animals at an auction! For sure, it’s one of those subjects on which people seem to have an opinion. Hello Sherry…we wish to thank you for sharing this information with us. Our daughter who has Eisenmenger’s syndrome, is working hard to raise awareness and raise the funds for her much needed adult stem cell transplant through her affiliation with her non profit, The Alliance for the Advancement of Adult Stem Cell Therapy and Research. After watching your video…our daughter wanted to donate a Toy Australian Shepherd puppy she has been raising, to a Breast Cancer Awareness event, A Pink Night to Remember to benefit Making Strides. We did our homework and due dilligence. Had a strong contract compiled and spent a lot of time educating the prospective bidders. Her donation…and beautiful puppy, we were told by folks attending, was the best and most wonderful gift and idea they had ever seen. Our daughter’s puppy, went to a wonderful woman, a registered nurse from Denver…who was/is a breast cancer survivor. A wonderful forever loving home for Li’l Dottie…and a huge donation raised (in our neck of the woods) over $2,300 to benefit their cause! Our daughter always hoping, to pay her blessings forward. We are so proud of her and that is what it is all about. Thank you…we so appreciate your advice and your work…for without it, this would have never materialized! My gosh, what a touching story! Thank you for taking the time to share this. I can see why you’re proud — and should be. Your daughter is a strong and generous young woman. (“Someone” has been teaching her well.) As for the animal, I suspect that the puppy couldn’t have found a better home. How cruel and inhumane to subject a defenseless animal to this. Your advice is reprehensible and you should be ashamex of yourself. Ann, I appreciate you sharing your concern. Puppies continue to be a part of some charity auctions and generate lots of interest among bidders (and generate dollars for the charity). While some people don’t agree with it, I share my tips on how to do it responsibly. In fact, additional information can be found in this post.